Microsoft appeared at Apple’s iPhone 6s event in September to talk about its productivity apps, helping Apple lure in some enterprise consumers to its iPad Pro. It was then followed by the company settling a long-standing patent war with Google last week when both the companies decided to settle all the 18 outstanding patent infringement cases. 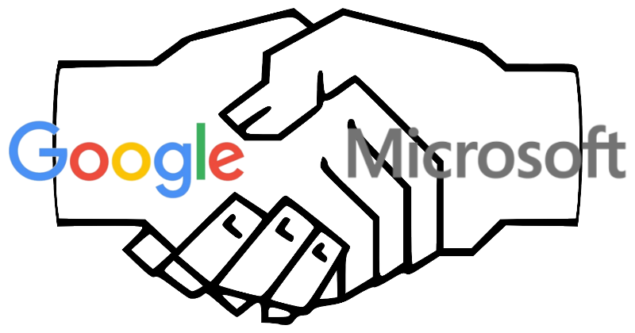 A statement released that day said, “Google and Microsoft have agreed to collaborate on certain patent matters and anticipate working together in other areas in the future to benefit our customers.” With Redmond having released its first every Windows as a Service (WaaS) this year, and holding possibly its biggest launch event this week, the company is proactively trying to be on good terms with other tech giants. As the technology bigwigs realize how fruitful their collaboration with each other is for consumers and more than that, for themselves, we are now looking at another rumor of Microsoft welcoming Google to its Surface Pro 4 event tomorrow. After the ceasefire between the two companies, rumors now indicate that Windows 10 users might be able to finally get their cherished and super useful Google Apps on Windows 10. Windows Mobile users have long lamented over the lack of Google Apps. Gmail, YouTube and Google Maps are some of the most popular services provided by Google. However, Google has long refused to bring any of its services to Microsoft’s Mobile OS as it insisted that Windows Phone’s market share is not large enough to develop the apps for the platform. With the lack of apps on Windows platform, users have to go with unofficial third-party solutions or use inconvenient alternatives. It could change very soon though, as an Arabic site claims that Google plans to attend Microsoft’s event this week in New York City to announce some of its services for the Windows 10 platform. Microsoft is reportedly launching its flagship Lumia smartphones, Surface Pro 4, a larger Surface, and a new Band among other products at its event this week. If this rumor is to be believed, we might be seeing Google taking to the stage to talk about its services very similar to how Redmond did at Apple’s event in Bill Graham Civic Auditorium.